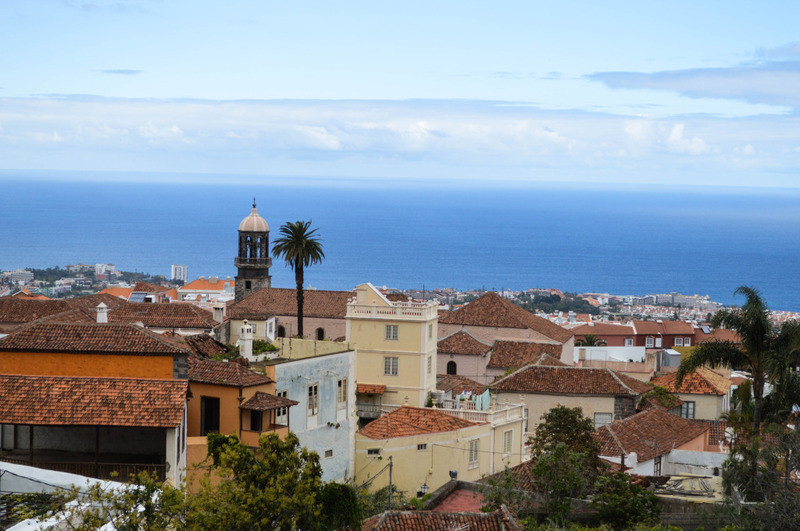 Tenerife is the largest of the Canary Islands and very popular with sunshine-loving tourists especially during the cold and dark winter months. I decided to look beyond beach resorts and explore its wild landscapes and vertigo inducing views during my long weekend break in February. Mount Teide, the third largest volcano in the world and Spain’s highest mountain, and the surrounding National Park were at the top of my list of places I wanted to visit from the moment I started to plan my trip. Since December I knew that obtaining a permit to access the summit or hike up the mountain would not be possible due to snow and ice plates. There was, however, an important piece of information unknown to me when I arrived in Tenerife on a crisp Friday morning. 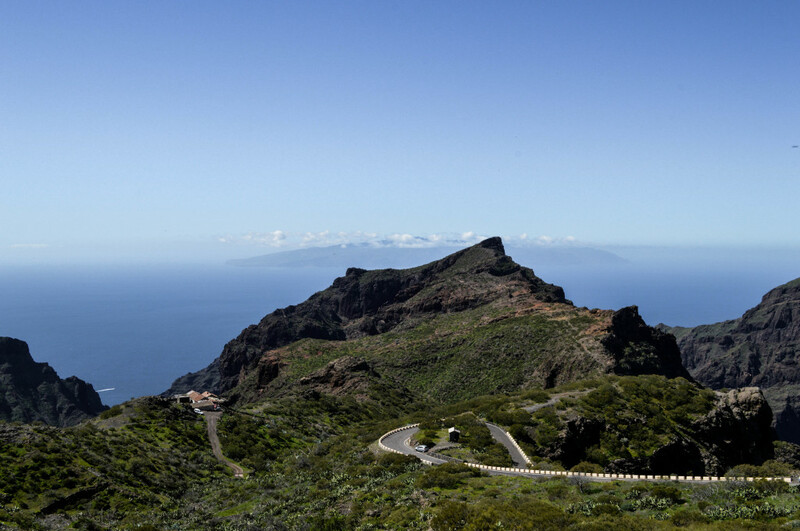 The roads accessing Teide from the north of the island were closed. A man working at the Tourist Information Office in La Orotava reluctantly shared the news with me when I went there to ask few questions, just to be on the safe side about my next day’s plans. It seemed like I was on a wrong side of the island though. After few minutes of walking back to Titsa bus station I made a decision that the snow was not going to spoil my plans! Together with a man working at the office there, with his broken English and my basic Spanish, we came up with my new plan of reaching Teide National Park. It got more complex as it involved two bus rides rather than one and would take me from Puerto de la Cruz to the south of Tenerife via Los Cristianos and Vilaflor. Oh well, at least I got a chance to see other places. Waking up before six o’clock to catch my morning bus was not an issue. The resort was quiet, peaceful and quite cold at that time of the day. When I finally arrived at Los Cristianos it turned out that I was not the only one, who booked a place to stay in the north of the island and did not want to miss the opportunity of seeing one of Spain’s Twelve Treasures. A very friendly British couple from Exeter wondered if anyone else except them would be crazy enough to get up before six o’clock and spend over an hour on the bus to reach this high destination. Oh, yes – me! In the end it was extremely rewarding to see this majestic view. On a clear day I would admire the Atlantic but on that Saturday Teide was immersed in the ocean of clouds. Without the permit and inaccessible summit I had to resort to going up to the top using the cable car, Teleférico, and hiking in Teide National Park. In practice it proved to fit around the public bus timetable very well giving me enough time to appreciate the landscape, take pictures and burn my nose from the blazing sun. Although during my stay on the island I managed to get to all the places using public buses, renting a car offers more flexibility and is worth considering for any drivers comfortable with the serpentine roads. My hiking companions booked accommodation at the hotel in Teide National Park allowing them plenty of time to explore it and more likely gaze upon the stars later that evening. On Sunday following my friend’s advice I planned an adventurous gorge walk from a small and picturesque village of Masca down to the beach. I took a bus from Puerto de la Cruz to Santiago del Teide and hiked to the village; however it is also possible to reach it by bus. Walking additional 5km seemed like a good warm up and I could not refrain from admiring the views while on the road. 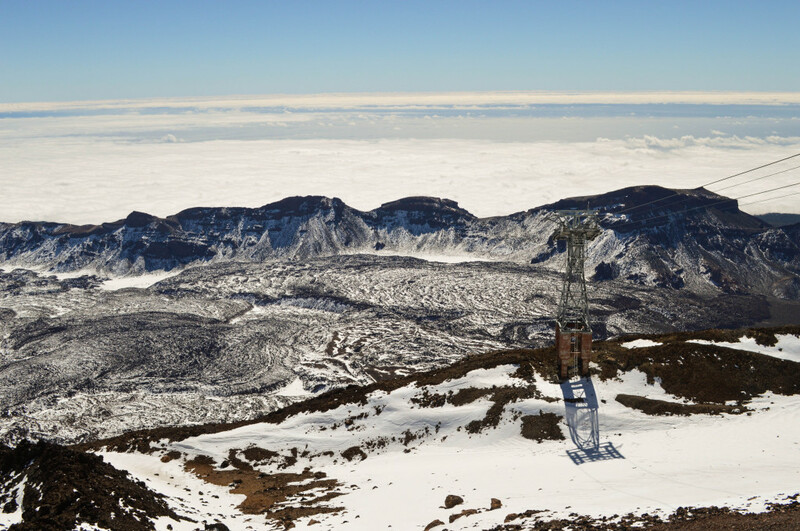 This time Teide was covered all in snow and except the rough waters of the Atlantic Ocean I could see in the distance another Canary Island, La Gomera. The Masca walk was demanding with its steep paths, very basic signage and a stream that gets fairly large at times and it took me around three hours with almost no break. There were moments when I had to use the chains to be able to pass so it is important to be well-prepared and reasonably fit. At times I wished for a helping hand but experiencing the silence and peacefulness of the gorge on my own was very fulfilling. I came across only a handful of people and we all shared the excitement of reaching the shore as well as the boat to the nearby town of Los Gigantes. On my last day before taking the plane back to Barcelona I visited La Laguna and wished I had more time to explore its charming city centre. Together with La Otrava it provides a far more authentic Canarian experience than other towns and proved to me that Tenerife has to offer a lot more than just the tourist-packed resorts and the winter sun. To view more pictures from this trip visit my Flickr. Thank you Sarah! Setting up this blog made me admire all your “Food For Think” efforts even more. You were right though – all that work feels good. Really nice piece, Weronika. I have been to Mount Teide in the summer and the colours are amazing, plus the views driving up were beautiful. I bet! Plus in the summer the visibility must have been much better. That forest on the way up was impressive. Thank you Julia! Bus communication on Spanish islands is an issue! Bus can come 15min earlier or 15 min later, the time on a bus stop information is just estimated time of arrival… But even so I like Spanish way of life. Great photos! Thanks for sheering amazing views! Looking forward to seeing your next insights. Yes, that was the case when I was coming back to Puerto from Los Gigantes. I had to wait for ages and since it was the last bus scheduled on that day I started to worry that I might be stuck there! I should write up something about my last year’s trip to Scotland – there was a lot of “catching the bus” action there! Thanks for reading.